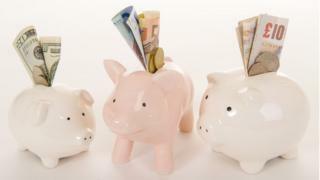 MSPs have voted to set a Scottish rate of income tax for the first time, opting to keep rates at current levels. Holyrood has been given new powers over the income tax rate, with Labour and the Liberal Democrats calling for a 1p increase to raise extra funds. However, finance secretary John Swinney insisted the rate should stay the same. 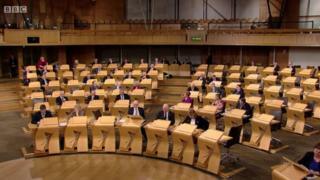 After a heated Holyrood debate on the topic, MSPs voted by 74 to 35 to accept the government’s plan to maintain the income tax at current levels. Opposition parties said an increase could create funds to protect services, but Mr Swinney said it would punish taxpayers on low incomes. Scotland’s tax powers: What it has and what’s coming? 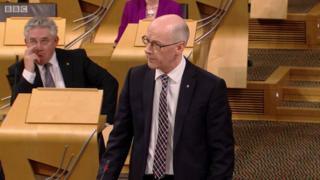 Mr Swinney said it was a “historic” day for Holyrood, with a Scottish rate resolution being proposed for the first time. The deputy first minister defended maintaining the rate at current levels following attacks from opposition members, saying his priority was to protect low-earning households. 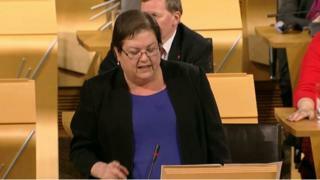 Jackie Baillie, leading Labour’s contribution, said the SNP was “voting with the Tories to continue the cuts”. She said members should “reject the do-nothing proposal”, arguing that increasing the income tax by 1p would raise a nine-figure sum to protect local services. For the Conservatives, Gavin Brown claimed there was a “taxpayers alliance” between his party and the SNP, describing the governing party as a “fiscal conservative party”. He said it would “send out entirely the wrong message” to raise taxes at the first opportunity with new powers. Willie Rennie said the Scottish government had failed to live up to “this truly historic day”, saying that in the face of cuts “the SNP do not one single thing, they don’t take any opportunity to change the climate at all”. He said the Liberal Democrat policy of adding 1p to taxes would be “progressive” and would have resulted in a boost to education spending. Scottish Greens co-convener Patrick Harvie called for raising revenue at a local level to protect public services. He advocated a “radical and local plan” to raise revenue by unfreezing the council tax. After an often fractious debate, members voted to support the government’s proposals by 74 to 35.